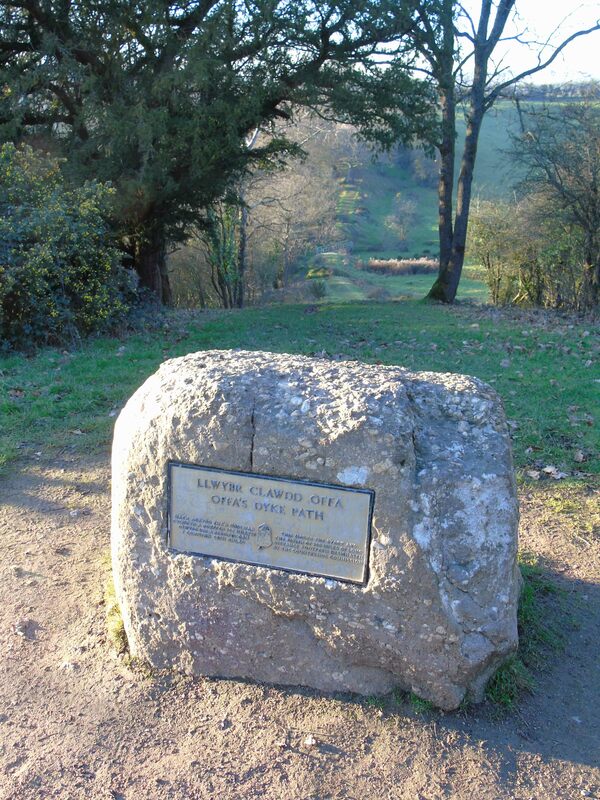 The farthest south point of the early medieval linear earthwork known as Offa’s Dyke is at Sedbury Cliffs, in the Forest of Dean. This significant location is marked by a monumental scale to the earthwork. The southermost Sedbury section of Offa’s Dyke runs across 1.6km of undulating higher ground from the Wye opposite Chepstow at Tallard’s Marsh to Sedbury Cliffs by the Severn. In doing so, it cuts off the Beachley peninsula which sits between the confluence of the Wye and the Severn. It passes through the suburbs of Sedbury, through Buttington Tump: a prominent high-point on the dyke before falling down into a tight valley and then rising up to Sedbury Cliffs. By departing from the Wyke and cutting off the peninsula, the dyke behaves in a distinctive manner to the sections to the north, where it marks the break of slope on the eastern side of the Wye Valley at least as far as Welsh Bicknor. Because of this distinctive behaviour, and because there are no discernible traces of the dyke along the Wye northwards of Welsh Bicknor and across the Hereford plain, the Sedbury part of the dyke is not universally accepted as part of the same monument that stretches intermittently north to Treuddyn in Flintshire. David Hill and Margaret Worthington argued that the Gloucestershire stretch, including the Buttington Tump section and all the bits-and-pieces up to Welsh Bicknor, were a different monument (or monuments), and thus disconnected from and perhaps of contrasting date to, the ‘true’ Offa’s Dyke running from Rushock Hill north (Hill and Worthington 2003: 143-54). Most recently, Ray and Bapty’s new book makes multiple arguments in favour of seeing the Gloucestershire dykes as elements of the same coherent programme of works as those from Herefordshire to Flintshire. They suggest that these sections contain styles of building and emplacement that can be found in the north Herefordshire and Shropshire sections of the dyke. Be that as it may, the section in question is distinctive in its monumental scale, and its behaviour in the landscape, suggesting it had a discreet and significant role as a boundary. This section has received 7 excavations, 5 by Hill and Worthington’s Offa’s Dyke project. It remains undated, but it definitely pre-dates AD 956 when it is mentioned in a document as a ‘dic’ (ditch). I visited this section recently for the first time and I would like to make a couple of observations. Housing and quarrying has disturbed much of its line from the east bank of the Wye near Chepstow towards Sedbury Cliff, but the monument is clearly visible as it approaches the cliff and the Severn beyond. It is monumental in proportions at this point, with a substantial bank, with evidence of quarrying behind it to the north. There is a significant ditch adapting the natural slope of the topography to the south. Whether it is especially monumental because it has sustained less damage here, or there is a deliberate emphasis upon its end-point, isn’t clear given the disturbance of the monument to the west of Buttington Tump. What is certain is that the very end of the monument is dramatic rather than ephemeral. The higher ground of this section of dyke allows good views over the lower land to the south, as well as across the Wye and Severn. Moreover, the alignment might be key: is it a coincidence that the line of this section is nearly straight between Sedbury Cliffs and the site of Chepstow Castle? Was there a fortified site, contemporaneous with the dyke, at this point opposite the Wye, predating the castle itself by some two centuries? From Sedbury Cliff, the dyke hits a natural monument of unparalleled character along the banks of the Severn Estuary for many miles upstream and downstream. The views from Sedbury Cliff are striking and given those at this point full visual command of river traffic crossing or traveling along the Severn. Moreover, it allows views over the dyke itself and the land below it. This must have been a key lookout point, immediately behind the dyke, perhaps originally fortified, and perhaps one of a series of beacons. Indeed, we don’t know, due to erosion, how much farther the dyke went in the Early Middle Ages and how the end of the monument was originally marked. Still, even if not elaborated in any regard, the natural cliffs created an imposing feature – both landmark and defensive barrier preventing the monument from being readily circumvented unobserved. As Ray and Bapty note, the dyke here is sea-orientated as much as land orientated. It simultaneously frames and defends from those approaching from the west, south and east. In meeting the Severn at this point, it looks into Wales but also into Wessex. In other words, in this location, the dyke dominating maritime crossroads including at least six directions – up and down the Severn, up and down the Wye, and across the Severn and Wye. Of course, in addition to its early medieval monumentality, the starting-point/end-point of Offa’s Dyke is marked in relation to its significance as a National Trail. A large stone with inscription marks this, and on the bridge prior to the final uphill stretch, there is a small plaque. Today, as perhaps in the 9th century, this was a monumental place: a meeting point between worlds, where Mercia began and Mercia ended.